The presumed incoming Democratic chairman of the House Judiciary Committee said on Tuesday he plans to investigate the drastic spike in U.S. hate crimes and whether federal investigators have wrongfully targeted racial and ethnic minorities instead of focusing on white supremacist groups. In a letter to the Justice Department, the Federal Bureau of Investigation and the Department of Homeland Security, Congressman Jerrold Nadler complained that the agencies had all failed to address prior inquiries by Democrats about hate crimes and surveillance activities when Republicans controlled the U.S. House of Representatives. “To date, we have received little or no substantive response to any of these communications,” Nadler wrote. “In the next Congress, this Committee will likely examine the causes of racial and religious violence, assess the adequacy of federal hate crimes statutes and scrutinize targeted domestic surveillance of specific groups,” he added. 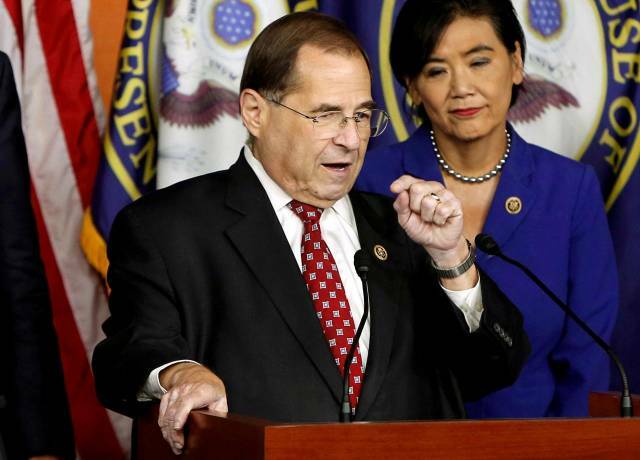 Nadler’s plans to scrutinize hate crimes and the federal government’s response to them marks the latest issue on a growing list that Democrats plan to probe when they take control of the House in January after making gains in November’s midterm elections. Other topics that Democrats have signaled could be probed include whether the Trump administration tried to block AT&T from acquiring Time Warner and retaliate against Amazon for political purposes, and whether President Donald Trump scrapped plans to relocate the FBI’s headquarters to avoid harming his business interests in the nearby Trump Hotel. New data released in November by the FBI found that hate crimes jumped 17 percent in 2017, and anti-Semitic attacks spiked 37 percent. That shooting came the day after federal authorities arrested a man in Florida for mailing explosive devices to critics of President Trump, including former Secretary of State Hillary Clinton and former President Barack Obama. Justice Department spokeswoman Kelly Laco, in response to Nadler’s letter, pointed to a list of hate crime cases the department has brought since last year. Among the cases is the high-profile prosecution of James Alex Fields, currently on trial for killing a woman by driving his car into a crowd of counter protesters after a white nationalist rally in Charlottesville, Virginia, last year.